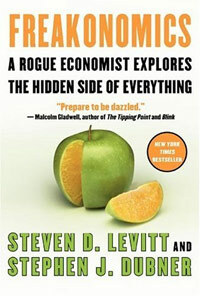 Freakonomics, by Steven Levitt and Stephen Dubner ($15 at Amazon), is an interesting New York Times-bestselling book about... well... I'm not really sure. I learned why crime decreased in the 90's, and in what ways I shouldn't trust a realtor. I learned the "blackest" and "whitest" baby names, and I learned why I shouldn't have a swimming pool in about 10 years. I learned more than I ever thought I could learn about crack dealing from an economics book. The authors mentioned a few times that their book (and Levitt's work as an economist) really didn't have an underlying theme. They were right, but they do have an underlying style: presenting everyday issues, usually those ignored by traditional academics, in straightforward economic analyses. Not only does it showcase examples of "the other side" of things, but it teaches you to think that way in everyday life. The writing is clear, light, and often humorous. It gets a bit long at times, such as the baby names section, but it's not too bad. The entire book is relatively short. I recommend this as an audiobook for a long car ride. It's interesting enough to appeal to almost everyone, it won't put you to sleep, and you can pause it when it prompts conversation with others in the car. Because it's more of an "isn't that interesting" book, it does not have much value for repeated reading, so it's perfect to rent as an audiobook to hear once. This is how I "read" this book, although I was alone in the car, and it was enjoyable. It's interesting and funny, and it's a fast read (or a relatively fast listen for the audiobook version, at about 6 hours). Freakonomics won't change your life, shape the world, or find Jesus for you, but it makes a great audiobook for a long car ride.